Housing collapse and financial turmoil leads to steep rise in estimated U.S. shortfall for '09, Congressional Budget Office says. The housing meltdown and financial market turmoil have taken a heavy toll on the federal budget. NEW YORK (CNNMoney.com) -- The U.S. budget deficit in 2009 is projected to spike to a record $1.2 trillion, or 8.3% of gross domestic product, the Congressional Budget Office said Wednesday. The dramatic jump to the highest-ever deficit in dollar terms compares to a $455 billion deficit in fiscal year 2008 and $161 billion in 2007. The estimate does not account for the massive spending and tax cuts proposed in President-elect Barack Obama's economic rescue plan. "As a share of the economy, the deficit for this year is anticipated to be the largest recorded since World War II," the CBO said in its annual budget and economic outlook report. As a percentage of GDP, the forecasted deficit for 2009 is not a record. But it is the highest since 1983, when the deficit ran at 6%, and it's the worst reading since 21.5% in 1945. This year's deficit could grow closer to 14% of GDP, depending on what actions the government takes. The CBO - which provides the official estimates of the budgetary impact of legislation and events such as wars and recessions - cites the housing market collapse and the financial market turmoil as the main culprits for the shortfall. The federal government has tried to combat the crisis by so far committing $7.2 trillion in investments and loans primarily to financial institutions. The current recession "will probably be the longest and the deepest since World War II," the CBO said. The economic deterioration since September, which was the last time CBO made deficit projections, is the biggest contributor to a sharp decline in tax revenue projections. The CBO expects tax revenue in 2009 to fall by $166 billion, or 6.6%, from the previous year's collection. That revenue decline, in turn, is the biggest reason for the worsening outlook over the next decade, said Diane Lim Rogers, chief economist at the Concord Coalition, a deficit watchdog group. "The revenue effect is huge." In addition, CBO expects inflation-adjusted GDP to fall by 2.2%. Going forward, the agency said it expects a "slow recovery" in 2010. "Normally sharp contractions in economic activity are followed by rapid rebounds, but this forecast anticipates that the recovery in 2010 will be slow for a number of reasons," according to the report. Among them, the CBO expects financial institutions will take time to recover from their losses related to the mortgage crisis, borrowers will continue to find it difficult to get credit and that will curb investment and consumption. The CBO's estimates come as Congress will begin debating a record-size recovery plan intended to stem the steep economic downturn. Whatever package lawmakers pass will add significantly to the deficit. On Tuesday, Obama suggested the country could see trillion-dollar deficits potentially for years. Obama's economic advisers have said they are working on a stimulus proposal that could cost up to $775 billion. But several noted economists have recommended lawmakers pass a stimulus package worth between $800 billion and $1.3 trillion. Soon after the release of the CBO report, Obama named former Treasury official Nancy Killefer to be his Chief Performance Officer. Killefer, a senior director in McKinsey & Co.'s Washington, D.C. office, will be responsible for scrubbing the federal budget of wasteful spending and inefficiencies. 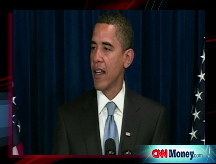 "Our problem is not just a deficit of dollars, it's a deficit of accountability and a deficit of trust," Obama said. "So change and reform can't just be election-year slogans. They must become fundamental principles of government."